Maruti Ertiga is one of the best selling MPV in the country right now. However, how it fares against its closest competitor -- Mahindra Marazzo -- in terms of styling and pricing? We find out in the in-pics comparison. Where the Ertiga looks subtle and has a businessy feel to it, the Marazzo looks more sporty and aggressive. The Marazzo is significantly wider than the Ertiga. The Ertiga’s side profile looks clean with minimal character lines. The Marazzo, on the other hand, carries forward it's aggressive styling, with character lines replicating the nose of the shark. Both the MPVs get a floating roof design. From the back, the Eritga looks more modern with L-shaped tail lamps and the tailgate that juts out from below the windshield. The Marazzo, on the other hand, takes a rather conventional design approach at the rear. Where the Ertiga comes with 15-inch wheels, the Marazzo can be had with 16- and 17-inch wheels. The Marazzo also gets all four disc brakes, unlike the Ertiga, which gets disc brakes at the front only. Pictured here are the alloy wheels that can be seen in the top variants of both the MPVs. 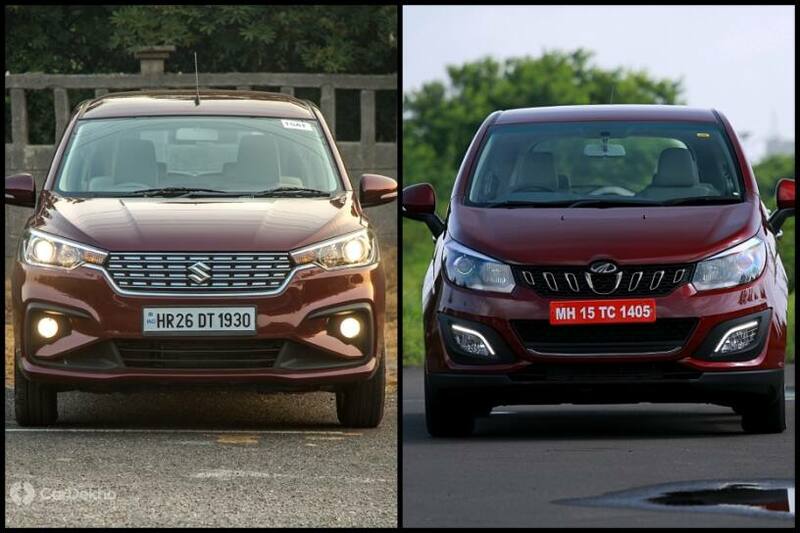 Maruti Suzuki Ertiga Vs Mahindra Marazzo: Which MPV Offers Better Space? Where the Marazzo’s cabin gets a dual-tone black-white finish, the Eritga’s cabin is dominated by the beige and brown combination. However, the Marazzo’s cabin might feel more premium thanks to the use of leatherette on doors and seats. The Ertiga gets fabric upholstery even in the top-spec ZDI+ variant. Both the MPVs get steering mounted controls but the Marazzo also comes with cruise control, unlike the Ertiga. The Ertiga’s steering wheel flattens at the bottom and gets wood-like inserts. The Ertiga comes with ventilated front cup holders to keep the drinks cooled. The Marazzo, on the other hand, comes with a conventional cooled glove box. Where the Ertiga comes with a conventional hand brake lever, the Marazzo gets aeroplane-like handbrake lever. Both the MPVs are equipped with a 7-inch touchscreen infotainment system with Apple CarPlay and Android Auto in their top variants. Both the MPVs get auto AC. However, while the Ertiga comes with roof-mounted blowers in front of the 2nd row, the Marazzo gets a large dedicated AC unit that runs along the length of the roof. While the Ertiga gets blowers, the Marazzo gets diffusers. Where the Ertiga is available as a 7-seater only, the Marazzo can be had with both 7 and 8 seater options. The 7-seater Marazzo comes with captain seats in the second row, while the 8-seater version gets a bench seat in the second row. While the Marrazzo gets the tumble forward feature for easy third-row access, the Ertiga comes with a slide and tilt functionality only. In the third row, where Ertiga can seat only two, the Marazzo can take upto 3 occupants. Both the cars get 2 adjustable headrests for the third row of seats. The Marazzo comes with sunshade for the 2nd row seats, a feature that is not available on the Maruti Ertiga. The Ertiga is powered by a 1.3-litre diesel engine that makes 90PS of power and 200Nm of torque with a 5-speed MT. It has a claimed fuel economy of 25.47kmpl. The Marazzo, on the other hand, gets a bigger 1.5-litre unit that makes 121PS and 300Nm with a 6-speed MT. Mahindra claims a fuel efficiency of 17.6kmpl for the Marazzo. Along with diesel, the Ertiga also comes with a 1.5-litre petrol engine that makes 105PS of power and 138Nm of torque. It can be had with either a 5-speed MT or a 4-speed AT. The Marazzo is not available with a petrol engine as of now. However, it will get a petrol heart post-April 2020, after the BSVI norms kick in. It is expected to get a 1.5-litre turbocharged unit. The Ertiga comes with dual front airbags, ABS with EBD, rear parking sensors, ISOFIX child seat anchors, driver and co-driver seat belt reminder and high-speed alert system as standard. It also gets hill start assist and electronic stability program but they are limited to the petrol-automatic variants only. The Marazzo comes with dual front airbags, ABS with EBD, ISOFIX child seat anchors, high speed alert system and driver seat belt reminder as standard.